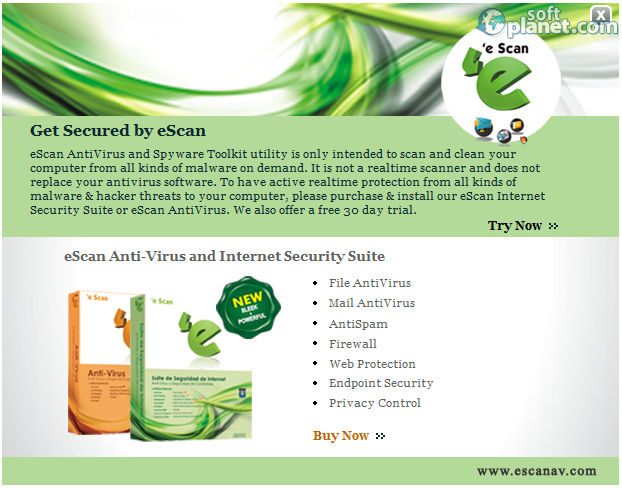 SoftPlanet makes it possible for everyone to get free eScanAV AntiVirus Toolkit download directly from our servers. There is no registration needed for downloading. Your PC slows down over time? It takes too much time to perform basic operations? Most probably your PC is infected by viruses, spyware or adware. This fact requires particular actions on your part. However you cannot handle this task all by yourself. That's why you need eScanAV AntiVirus Toolkit 14.0.99.
eScanAV AntiVirus Toolkit 14.0.99 can be used to analyze OS services, the registry, system folders or the startup directory. You can even set it to entirely check local drives. The application allows you to scan a specific folder for keyloggers, viruses or spyware and adware components. One of its best features is the startup functionality, which allows you to add eScanAV AntiVirus Toolkit 14.0.99 to the startup list of Windows. Thus it will perform the scanning and cleaning process each time you turn on your PC. The app comes with frequent updates of the database definitions in order to keep itself aware of the latest threats. 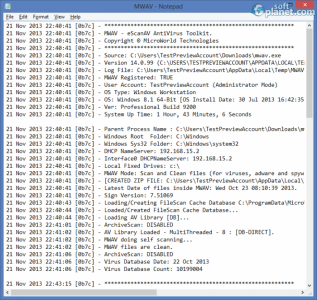 eScanAV AntiVirus Toolkit 14.0.99 has a very simple interface, completely oriented towards users. It doesn't come with the most appealing design. However the only thing you could possibly want for such software is to scan and clean your PC and not have some fancy look, right? Everything you need is placed within a single window. The app uses an external app for displaying reports and logs – Notepad. I was really surprised how well organized its interface was. There aren't any endless menus and sub-menus, which can just confuse you. All available features are a single click away from you, which makes it very intuitive actually. Thanks to its plain interface the application is very easy to use, because most things you can do with it require almost no actions on your part. eScanAV AntiVirus Toolkit 14.0.99 seems to be a very stable software product. However I noticed some delays, when it comes to generating and viewing virus lists. Despite that everything else works just fine. The entire app didn't crash once during the whole test. eScanAV AntiVirus Toolkit 14.0.99 is a proper software utility, if you want to keep your PC protected against viruses, spyware and adware. However please be aware that this free version is only capable of scanning your computer. If you want to clean the threats found, you need to purchase the program. eScanAV AntiVirus Toolkit is VIRUS-FREE! 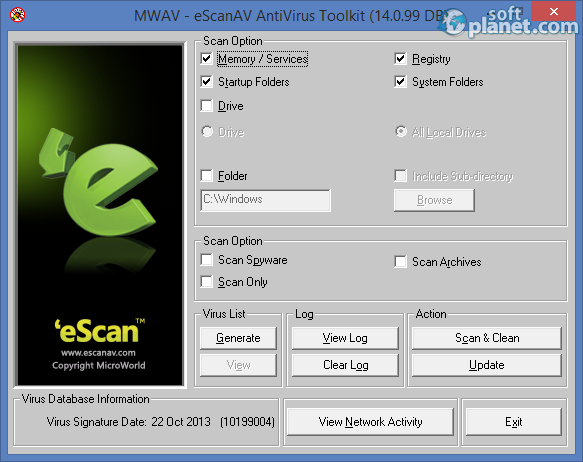 Our security scan shows that eScanAV AntiVirus Toolkit is clean from viruses. The current version of eScanAV AntiVirus Toolkit has been scanned by our system, which contains 46 different anti-virus algorithms. That ensures that eScanAV AntiVirus Toolkit 14.0.99 is 100% safe for your computer.